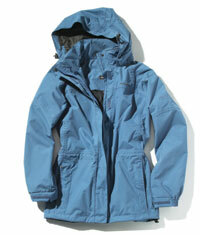 Craghoppers says:"Our de facto women's walking jacket. Constructed from waterproof, breathable AquaDry fabric, it's a jacket that's designed to keep the rain out on the wettest of days." I've worn the Craghoppers Madigan waterproof jacket on a number of lower level walks during a variety of Autumnal weather featuring light rain and wind. The fit overall was very good and true to size - although I would have preferred a little more length in the sleeves. (I do have relatively long arms!). The jacket is nice and long and so provided good coverage around the tops of my thighs. The adjustable waist, hem and cuffs provide a number of options for altering the look and increasing the 'snugness' of the fit. The hood (which is detachable and can be rolled away) has a wired peak and when fully fastened in combination with the brushed chin guard provides a good level of protection for the head, face and chin. There are two external hand warmer pockets plus two internal, zipped 'dry' pockets. Access to the two hand-warmer pockets when wearing a belted back-pack, wasn't easy though. There's also a (well!) concealed map pocket at the left front - a great idea but slightly fiddly to use when wearing gloves. The main front jacket zip has a nice chunky tag which is easy to use when wearing gloves. The jacket certainly kept out the light rain and wind I experienced so for the most part I was very comfortable although I did find that during periods of higher activity, I was pretty warm. The fabric isn't as breathable as that used in more expensive jackets - but I guess that's to be expected. Whilst you may want to consider a more expensive option for higher energy activiities and/or for higher level winter walking, the Craghoppers Madigan waterproof jacket is a a good value option for lower level walking - or use around town.